I bought a chinese made 3-cavity bandpass filter and decided to measure it and compare it to some home-made modified duplexer filters. 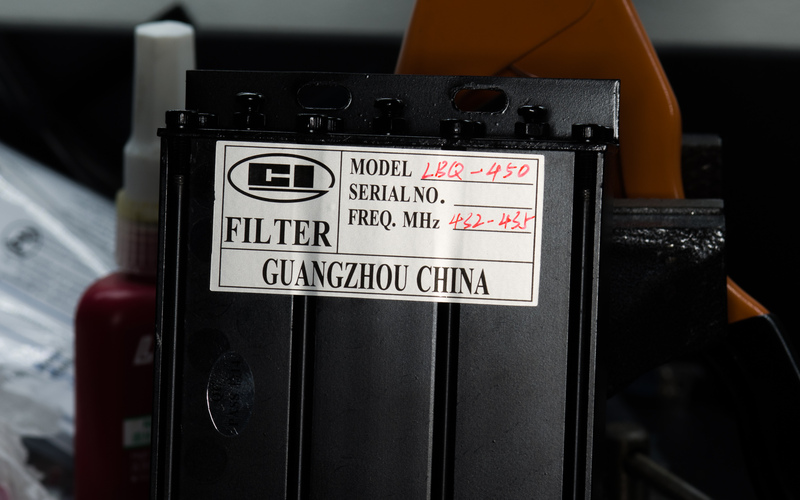 The LBQ-450 filter is sold by several eBay sellers, I bought mine from yee-cssl at a slight discount via an auction listing. The table above contains the specification from the eBay listing. I ordered mine with a spec of 432-435 to cover the Norwegian 70cm band. Shipping took several weeks as usual, when it arrived it was packaged in a cardboard box containing a smaller styrofoam box. This seems to have been perfectly adequate, since the filter was still tuned correctly and looked fine. The filter looks nice and feels solid. It's annoying to have the N ports on the sides but this is probably done for technical reasons. 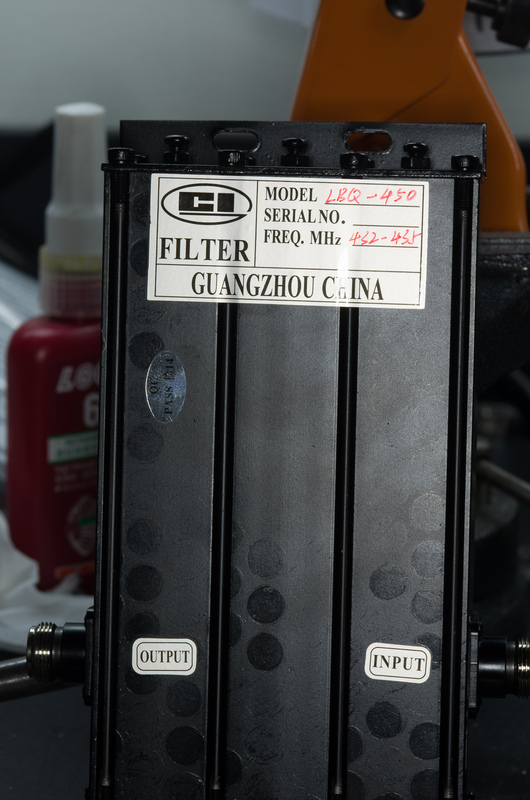 There is no obvious way to adjust the Q of the filter like the superficially similar Procom variants. This performance is perfectly adequate, showing approximately +-20 MHz -60dB performance and good linearity. I didn't adjust the tuning so this is the performance you can likely expect if you order one pre-tuned. I didn't test the filter under power, it's fairly wide so it'll probably be fine as long as you derate the power reasonably. 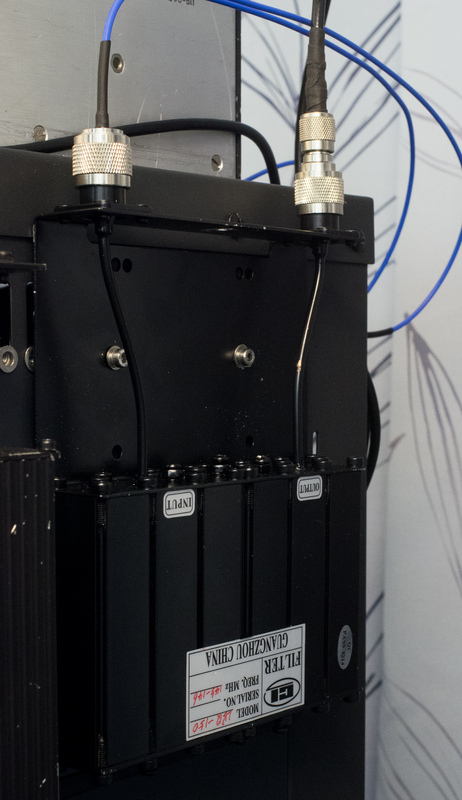 The LBQ-450 is a pretty high performance low cost 3-cavity filter, it has good wide-band and narrow-band performance. I can recommend this for general purpose use (e.g. for receivers, or user operated stations). I can't say if the filter is thermally stable enough for 100% duty cycle use at the rated power, you'll have to do your own tests there. I've previously modified the coupling network on a Procom BPF70/6 6-cavity duplexer to make 2 pcs. 3 cavity bandpass filters. Wide-band performance is very similar, the curves below show the narrow performance of the filters with the same setup as above. 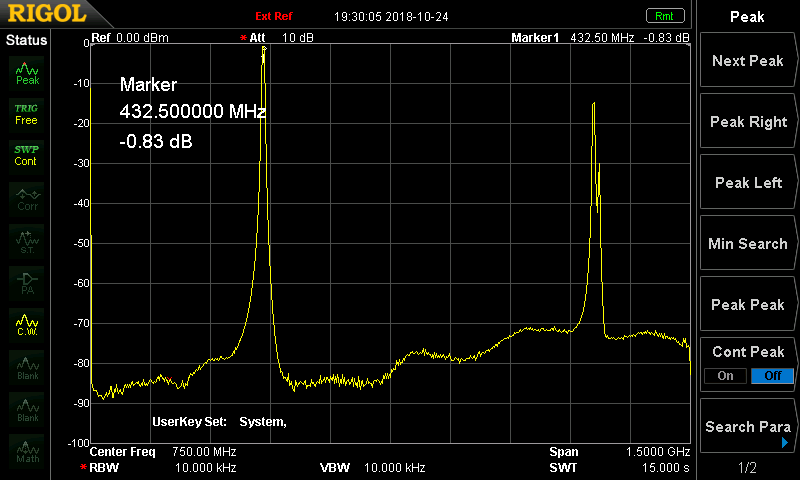 The two DIY bandpasses perform slightly worse at high side attenuation, but are reasonably similar in the pass band and only slightly worse on the low side. Also note that the cavity coupling studs are currently A2 stainless steel, I'll report back in a future post if replacing these with brass improves performance. 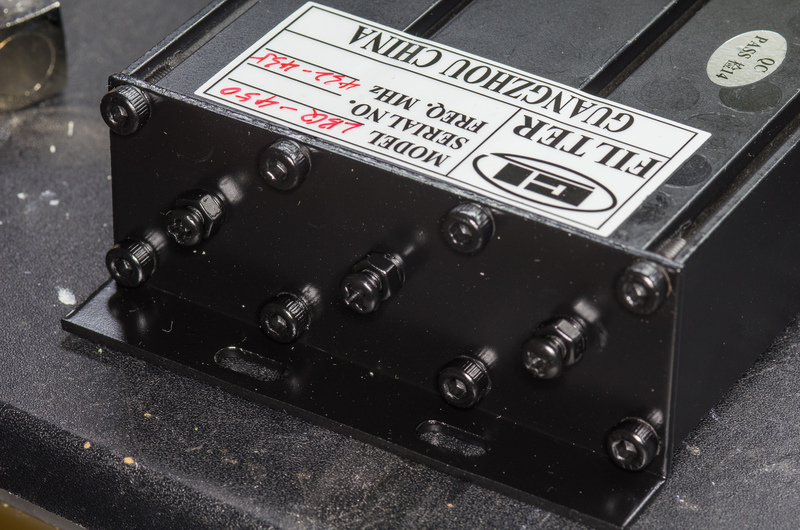 The LBQ-150 VHF filter is listed as a 6-cavity filter, it's built using the same chassis/frame as the equivalent mini duplex filters. These filters are more correctly described as helix filters, since they (obviously) use cavities that are far smaller than they would be if they were full 1/4 wave cavities. To resonate, they use a coil instead of a solid radial. In this case the frame is somewhat oversized for the actual filter, which makes it longer than necessary. The overall size is about the same as the UHF filter. The end-cavities don't seem to do anything (changing the tuning has no effect). I suspect they had trouble making a useful 6-cavity filter due to the losses and found a 4-cavity worked better. 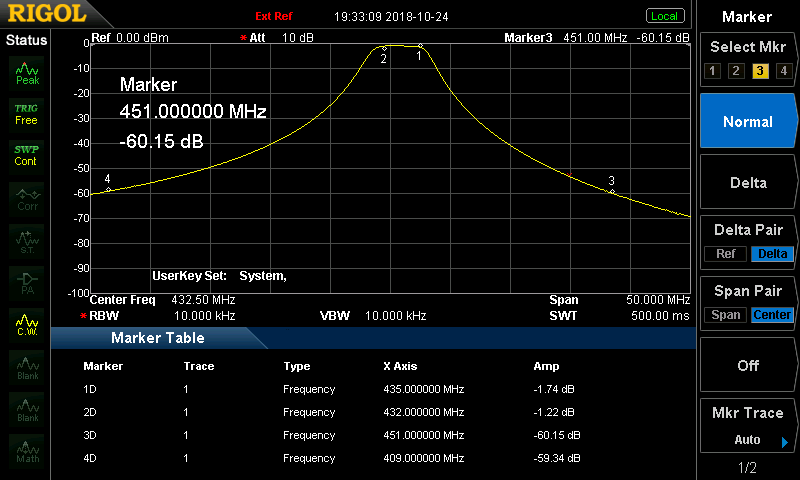 I didn't record the spectral response, but it has strong coupling at all odd harmonics including 433 MHz. This isn't hugely uncommon however. Insertion loss was around 2 dB across 145-146 MHz, somewhat high. At the price I got this it's definitely useful (I got mine via an auction at around half the list price). It looks like this filter was designed to be built using modified duplexer parts. The compact size is nice, but I doubt it can handle much power without thermally detuning at 2 dB insertion loss. I would have liked to see adjustable coupling to trade bandwidth for insertion loss. My intended use is primarily to ensure my VHF radios don't interfere with other VHF equipment (including air-band receivers), and for this purpose it provides sufficient attenuation. If you can get hold of a full cavity filter like the Procom I previously modified for 145 MHz operation, I would recommend using those instead.